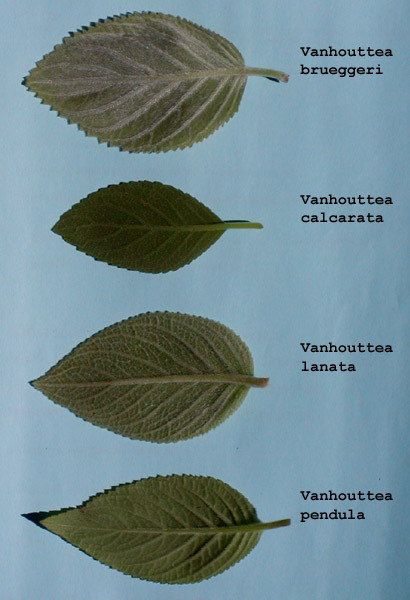 The picture shows four Vanhouttea leaves from the back. The petioles (leafstalks) were clipped as close to the stem as possible. 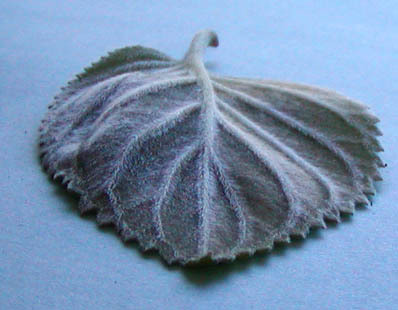 The leaves are similar in most respects, but a few differences can be seen. V. calcarata has the smallest leaf of the four. Leaf size depends a lot on where and how a plant is grown, but the relatively small size of the V. calcarata leaf is consistent under my growing conditions. V. lanata has the shortest petiole. The leaves are almost sessile. The other species (including V. hilariana, not pictured here) have "normal" petioles. V. pendula has red petioles. This is not so evident in this view. From the top, the difference in petiole color is clear. The other three species (and V. hilariana) have "normal" green petioles. The leaves are hairy, in differing degrees. The first photo, being taken from above, does not bring out the hairiness too well. The photo below, of V. brueggeri, with both contrast and brightness enhanced (so the colors aren't natural), shows the hairiness, and how the hairs are concentrated along the ribs. These hairs are straight, while those on the V. lanata leaf are more matted and tangled, and form a kind of covering over the surface. The hairs on the V. pendula and V. calcarata are short and straight, and not as dense as those of the other two species.